CHRISTMASTHE EMBRACE PARCELS EXTRAORDINARY Get ready for anjoy intriguing Bring happiness, and sensory adventure: challenge good cheer to the season with this collection your taste-buds asofwe celebrate perfectly paired presents the extraordinary with this and stocking filler exceptional selection single casks. of new single casks. One item that often causes discussion (if not confusion!) amongst members is the allocations we get here in Australia. In particular, members may wonder why we get 12 bottles of one particular cask, yet 42 bottles of another cask? Does it mean the cask with only 12 bottles is rarer or more valuable? No, not necessarily. Allow me to explain… With each production run the Society does (i.e. when we elect to bottle our casks), the international branches are alerted and given an indication of the expected outturn (i.e. total number of bottles) from the casks that are being offered to us. Not surprisingly, the contents of one, single cask can’t be shared amongst 20,000 global members, and so casks are typically allocated and shared amongst certain branches. In other words, if the Society bottles two casks of Laphroaig, then one cask might be offered to six or seven branches only, and the other cask would be offered to the other remaining branches. The allocations are obviously a function of each branch’s membership size and consumption/ordering patterns. This is why you’ll often see casks on the UK website that we don’t feature here in Australia. But don’t worry, it cuts both ways: There are plenty of casks we feature here in Australia that the UK never sees or gets to taste! One of my tasks as Cellarmaster each month is to go through what’s offered to us and to place orders for our next shipment. In terms of the quantities we request, we have to take a bit of a punt as to how popular we think a cask might be. If it’s an obscure distillery or a particularly expensive bottling, then it follows there might not be much demand, and I may request only 12 or 18 bottles. On the other hand, if it’s from a popular distillery or a style/ Flavour Profile that we know our members enthusiastically pounce on, then I’ll request significantly higher quantities – anywhere up to 240 bottles! By the 1980’s, there was an emerging and growing market for single malts. Whilst blends presented a merged, rounded whisky that offered a little bit of everything, single malts allowed a more focussed flavour or style to be showcased. And so it was that two distinct styles emerged: whiskies that were matured in American-oak bourbon casks (vanilla, sweetness, tropical fruits), perhaps best typified by the flagship offerings of Glenmorangie, Glenlivet and Glenfiddich, and those that were matured in European-oak sherry casks (spices, dried fruits, tannins), perhaps best typified by the likes of Macallan and Glenfarclas. For the entire history of Scotch whisky, this had been the norm: stick the spirit in a cask, let it slumber for a few years, then tip the cask out and either bottle the spirit “as is” or blend it with other spirit. If the cask was American oak and/or ex-bourbon, you got one style; if the cask was European oak and/or ex-sherry, you got another style. And never the twain shall meet. Until one day… There are two claimants to the title, but general consensus these days is that it was David Stewart, Master Blender at the time for William Grant & Sons (Glenfiddich and Balvenie) who was the first to come up with the concept of “finishing”. That is, to take whisky that had chiefly been matured in one type of cask, and to then transfer the contents into a different cask type for a short finishing period. The story goes that Stewart took Balvenie that had been matured in American oak ex-bourbon casks (and was sufficiently matured and ready to drink), but re-racked the whisky into some sherry butts for a short period. The whisky thus took on some of the character from the second cask-type and a new flavour profile for Balvenie was born! That was back in 1983. What was once an experiment is now incredibly common, with most brands now having at least one finished whisky in their portfolio. Ex-wine casks that previously held port, sherry, madeira, sauternes, chardonnay, etc, are typically the finishing cask, although sometimes it’s more about the wood, e.g. French oak or even Mizunura oak! It was about 10 years ago that Glenmorangie dispensed with the term “finish” and instead coined the phrase “Extra Matured” – a term that is now gaining favour with other players in the industry. It was a few years ago that the Society began to play around with finishing or extra-maturing with some of its casks. Sometimes it might be to explore new flavours; sometimes it might be to create a flavour profile that is different to the “house style” typically associated with a distillery’s reputation; and sometimes it might be to inject some life and sparkle into a cask that was maturing too slowly. Virgin oak casks can be used to tremendous effect in such cases, as the active wood not just imparts new and fresh flavours, but also accelerates the interactive process and relationship between the spirit and the oak. MALT OF THE MONTH Welcome back lucky 88! Nestled in a cosy little glen, just outside the same village thatâ&#x20AC;&#x2122;s home to the likes of Glen Grant and Glenrothes, distillery 88 is shrouded in forest. Their use of worm tubs and old-fashioned production techniques give this malt a solid backbone yet fragrant and delicate delivery, even at cask strength. Cask 88.11 is just the eleventh cask ever for the SMWS and a truly delightful Day at the Beach. The smell of burning driftwood combined with salted toffee and liquorice before taking on the charred character of barbequed orange and sausages. Salty seaweed created an interesting interplay with peanut brittle before taking on a suggestion of fruit with cherry chocolates. Ginger cake and rum introduced spicy notes that formed into aniseed and rye bread. Thick cut marmalade brought rich fruit that echoed fine warm Cognac and developed a singed note like burnt raisins in a fruitcake. Charred spice rounded out the palate with hint of cinder toffee rolled in ash and fresh ginger. The scent of seafood paired with sweet, spicy and fruity aromas make this a real experience; a lobster mango salad with Thai crab cakes and a sweet chilli sauce seasoned with coriander, salt and black pepper. With this we serve a Pouilly-FumĂŠ dry white wine from the Loire; stony minerals and lemon flavours balanced by a smoky floral fruitiness. With a few drops of water, we enjoy our salad and wine sitting outside a cottage by the sea and as the full moon lights up the night sky we share stories and songs by the smouldering peat fire. TWISTING IT UP “Well you’re just everywhere at the moment, huh! This is a line I’m hearing more and more, especially as I zip around the country for the first big round of member events, experiences, tastings, dinners, pairings, and the odd private booking here and there. That’s a little-advertised portion of our day-to-day operation. If you as a member want to ever consider a fully-hosted private tasting, that’s something we’re always happy to discuss as it’s our area of expertise! PAPER OR PIXELS? WHAT IS YOUR PREFERENCE? Just a reminder to let us know by April 15th if you’d like to continue receiving Outturn and Unfiltered in the post. PAPER IS MY PREFERENCE If you are fan of the touchy-feely paper version, and like to browse in bed (or wherever else), then we will happily continue to provide your whisky reading material in tangible form. All you need to do is to let us know by Monday 15th April that you’d like to keep receiving Outturn and/or Unfiltered* by post. 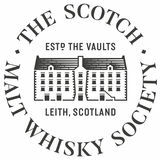 Drop us an email at admin@smws.com.au, call our office, message us, or send us a postcard(!) to opt-in, and you’ll continue to receive your paper copies from the postie. I HEART PIXELS If you are happy viewing/reading the online versions only, then no further action is required. 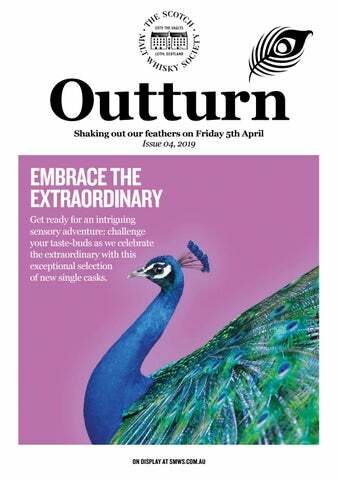 Your last paper Outturn will be the April edition, and Unfiltered will be online only for you from the May edition onwards. Just a reminder that you can download online some or all pages from both these great publications if there is a particular article/ section/bottling of interest. For those of you going digital-only, as a wee thank you from the trees now saved from the paper mills, please use coupon code ILOVETREES to receive $10 off your next online purchase. Lotus Dining Dessert Chef extraordinaire, Pierrick Nicol, crafts some of the most delectable desserts around a range of Society casks. A fun evening exploring whisky myths and magic, sharing a few myths or even myth-takes while enjoying some fabulous drams! Join our Cellarmaster for a tasting that turns back time: old school whiskies explored in an old school masterclass presented by an old school host. SMWS X FIXATION BREWING CO. BOILERMAKERS An evening of amazing IPA craft beers at this IPA specialist brewery and all matched to our newest Society malts. WHISKY – FROM THE BEGINNING What is whisky? What is the Society? We’ll explore how that glorious liquid gets from grain to bottle, along with how to get the most out of your SMWS membership! A SATURDAY SUNDOWNER – CHALLENGE THE PANEL Taste a range of Society whiskies and come up with your own bottling titles. You ARE the panel! Prizes on offer. FOR MORE INFORMATION OR TO BOOK IN FOR ANY OF THESE EVENTS, PLEASE VISIT OUR WEBSITE OR CONTACT OUR OFFICE. Society whiskies are offered and sold through The Wine Empire Pty Ltd, Liquor Licence LIQP770010175.